Fried noodles is a popular dish in East and Southeast Asia, which can be cooked in many varieties and cooking styles. 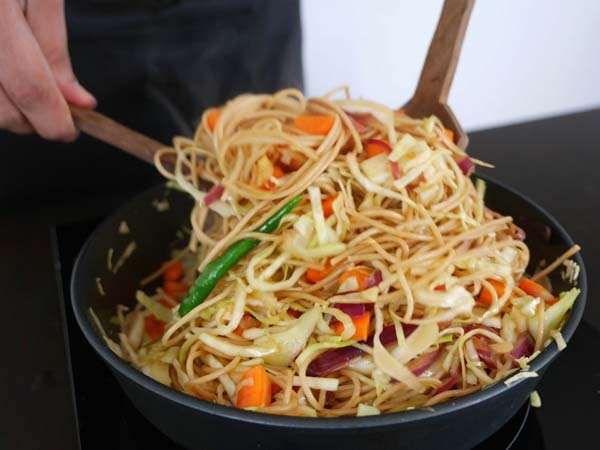 Here is our favourite version: an easy stir fry recipe with fresh ingredients found in the kitchen, that will also suit vegetarian and vegan foodies! If you ran out of noodles, you can use normal pasta, spaghetti, and the result will be equally delicious. A perfect option for a healthy and filling lunch or dinner, that doesn’t require hours in the kitchen. Step 2. Peel the carrots and chop them into small pieces, cut the cabbage into thin slices, cut the onion. Chop the spring onions (if you don’t have spring onions you can replace it with parsley) and put them away, you’ll add them in the end. Step 3. Peel 2-3 cloves of garlic and chop them into very small pieces. Take the same quantity of ginger and cut it into small pieces too. Cut in two pieces a chilli pepper. Step 4. Heat some olive oil in a pan, add onion, garlic, ginger and a chilli pepper. Stir it for a few minutes. Now you can add the cabbage and the carrots. Continue cooking till the cabbage is soft (between 5 and 7 mins), add some salt, vinegar and some soya sauce. Mix well. Add boiled pasta and mix it well again. Step 5. Top the noodles off with the spring onions, mix everything well and take off the stove. Your fried noodles are ready! You can surprise your friends and family with an unusual spaghetti dish!